No close or fun games these days? I gave this game away almost a year ago mainly as I wasn't finding it much fun. Started playing again and having a lot of the same issues that made me lose faith originally. That is, one sided games, I don't care if I'm the winning or losing team (winning is preferable) but since I started playing again the matches are really one sided. 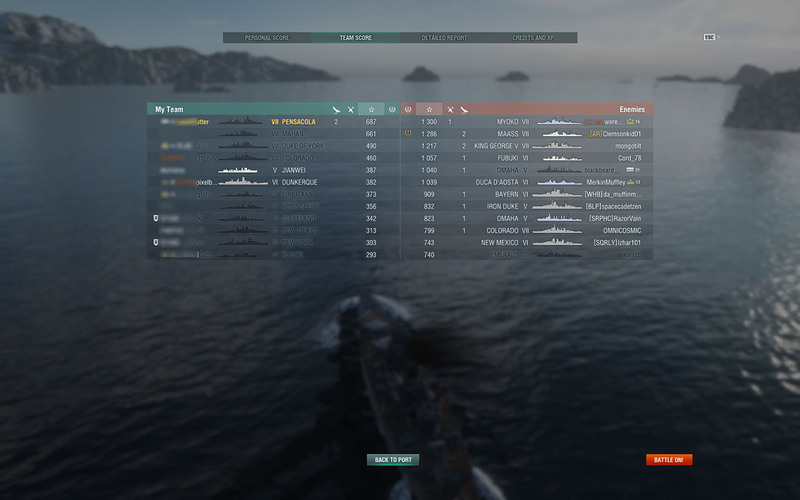 Usually get a team of complete morons who just lone wolf it, rush caps with zero support or just yolo attack a large group of enemy ships. A earlier tier 8 -10 game had half of one team annihilated in the first 3 minutes, completely unacceptable for a high tier game. Another 2 losses in my Mahan today when not a single enemy ship was lost.. 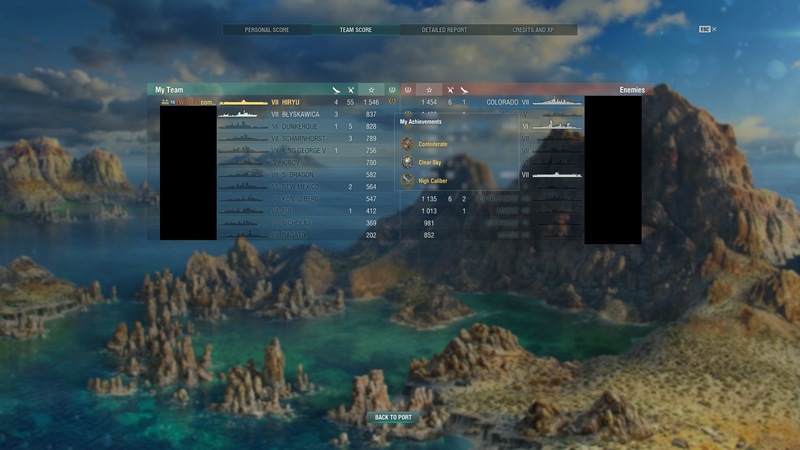 When I gave it up there were growing calls for the MM to look at player abilities more than what boat they are driving. Looks like nothing has been done. My last game is another classic example of terrible players getting thrown against competent opponents. Matchmaking keeps doing this to keep the medium playerbase at around 50% winrate so you get into these rollercoaster win streaks and lose streaks that are usually one sided blowouts and is not fun, from time to time you get a team that fights back and it gets semi close but those are 1-2 for every 10 game I'd say in my experience. I had 3 games today that were extremely close and got my first solo warrior. Never before have i had 3 close games in 1 day.... weird. Part of the problem is that there are a lot of sub-standard players who just don't know or care to sail their ships in a good, defensive manner that will keep themselves alive as long as possible. And put those players in DDs and they'll be dead in the first 2-3 minutes because they just don't know or care how to play DDs well. I think that part of it is that people get it drilled into their head that DDs absolute HAVE TO charge into caps and brawl for them, no matter what the cost. Well, the cost usually is that they die and the enemy gets the cap. Now, note that I'm not advocating ignoring caps. What I am suggesting is that there's a smart way to attempt to cap and a dump way. The smart way is to know when it's time to withdraw, to know that the better part of valor is to learn to run away to fight another day (or a little while later in the same battle, as it were). And then there's the dumb way, which is to usually to have only to try to win a cap brawl no matter the cost and to heck if you get sunk. And the same holds true for other ship types, on another level. Too many players just don't seem to understand the concept of disengaging from the fight. They seem to know only one way. Once the engagement has begun, fight to the death, without the slightest thought towards disengaging and withdrawing, and trying to heal up, if you have heals. Or just to break contact and open the range, so that you can continue the fight at a longer range and let other be on the front lines of the fight. I had a really fun game today in my Marblehead. Had 7 kills (in a win on Strait), which surprised me. I didn't even realize that I had even close to 5 when I noticed the Kraken notification show up in the chat box. I really enjoy playing my Marblehead. And get a kick out of people saying as how the Omahas need buffing and all. I almost always seem to do well in my Marblehead when I take her out, even when I'm in tier 7 battles. Maybe I just know how to really fight this particular ship well. Was the battle a close one? Not really. Could it have been? I suppose so, but I was on a roll and I wasn't letting anyone on the enemy team get anything done, at least on my side of the map. They were NOT going to win my side of the map! if they'd won the other side of the map, it might have been close, but they didn't. And I sure as heck didn't let them win my side of the map. So, fun was had by all on team Green. Not so much for team Red. On the past month have had some really good games that went to the wire and a bunch more that took most of the play time. close fun games are very few and far between. The play has been pretty bad lately. People liked to blame weekenders or people on school break, but this was about par for the course today. When the person on the losing team gets top XP, Confederate, high caliber, and clear skies, there's a lot of bad play. All of my games this afternoon were either nailbiters or reasonably close. Just bad luck for you (or good luck for me), it seems. If MM matched players by skill, there would be less one-sided matches. Just think about it. Although that's a correct assumption, and I'd be all for it, the downside of that is, far longer queue times for players of high skill/better win rates. and thus WG will never do it unless the player base gets HUGE. What I've seen just in the 10 battles (2 wins 8 losses) that I've fought so far today, has been the majority of my team rushing to one side of the map and staying there, not attempting to cap or defend/capture anything. In the 2 wins I've had, the Red team did that. I've seen this a lot in the last few weeks, but it's really been bad today. And of course, one on the combat missions is "win 3 battles". Everytime there's a requirement like that it jinxes me! I KNOW when I see something like that I'm gonna have a major losing streak. I see the blow out now and then, but I have a lot of close games. Some downright nail biters...to the wire. Lots of new steam players derping around as they casually move up the tiers too. I don't know, I had a few real nail biters today. My first battle of the day was decided when my team pulled ahead on points with less than 10 seconds remaining. That one actually got my heart pumping a bit. Later I played a standard battle that came down to an incredibly close cap race that only went in my favor because of a few clutch shots to reset the enemy, and the fact they had one DD who thought left our cap to try and stop us from capping out. Sure, there are a fair share of blowouts, but there are still quite a few close games as well. I just watched in disbelief as my Teams last remaining BB, a full health Konig steams out from cover to attack 2 90% dead BB's at 7k, both enemy BB's took defensive positions but the ####wit in the Konig plods out exposing his entire flank, needless to say he died very quickly and inflected almost zero pain on the opponents. Just felt ripped off as I did 120k damage in a tier 5 BB and sunk 4 ships yet most of my team just suicided contributing nothing.